​​We celebrate Christ’s passion, death and resurrection at every Mass. Jesus said “Do this in memory of me.” It is very important that your child understands that during the consecration of the bread and wine, through the words of Christ and the power of the Holy Spirit a change of the whole substance occurs and the bread and wine become the ACTUAL Body and Blood or our Lord Jesus Christ. 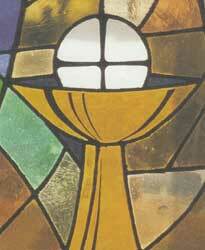 The bread and wine are no longer just bread and wine it is “Jesus”, the Eucharist, the center of our Faith! Education before receiving these sacraments. Also brief orientation meeting for parents at end. NOTE: This is a new date!! Students only attend. Fun night ! What an exciting year for children....we feel privileged to share it with you! Any white dress, short sleeve, long sleeve or no sleeve OK. sweater OK too. Veil or head piece is your option, not required but OK. Light/white shoe, tights or socks. No gloves during ceremony only. White long sleeve button down shirt - white tie - navy docker pants and dark shoes. Jacket is optional but not required. Note to Girls families.....I have several white communion dresses that people have given me, only worn once. If you would be interested in looking at these please just give me a call or e-mail and they're yours! !